This guys called Repulse, an 80's British Punk Hero with Magnetic powers, another commission for Mike Lafferty. nice stuff. Like the attention to detail... like I can telll that is a kalishnikov rifle being tk'd disassembled. @storn, thanks dude, the perspective angles on the AK-47 were a nightmare but in the end I think it was well worth it. 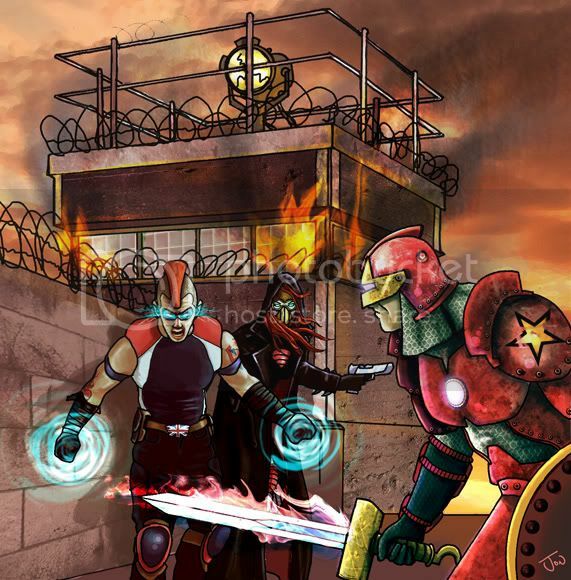 So, as i'm sure many of you know I've been doing some artwork for Mike Lafferty's DEFCON sequel. Mikes next couple of commissions are full colour interior action scenes. 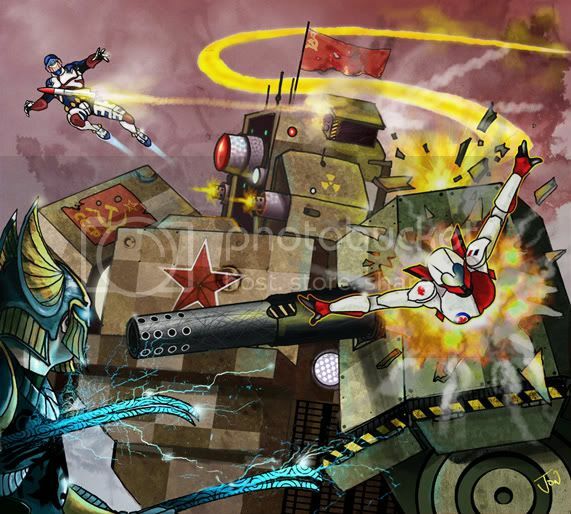 First up shows a battle between a Huge Soviet Mech VS three of the western heroes, Steel Eagle, Arrow and the New American. This one took around 15 hours. pen+ink on paper then scanned and coloured in PS. Last edited by DrZero on Sun Jun 14, 2009 8:49 am, edited 1 time in total. Nice Doc. Very dynamic and the colours are great. Here's another interior illustration for one Mike Lafferty's DEFCON 2 books. about 12 hours, pen/ink and Photoshop. Last edited by DrZero on Sat Jun 20, 2009 3:20 am, edited 1 time in total. Nice texture on the Soviet Swordsman armor! The painting/coloring is impressive. And it's cool to see previous character in other outfit (even if I prefer Repulse with is union jack flag t-shirt)..
Now these last two pictures are just distilled Comic Book awesome! You could - and probably should! - use them as alternate covers for the finished product. @Libra: cheers Libra, not sure what Mikes got planned for them, I think their interior colour pieces. Ah. Well I'll be glad to see them in their proper context when the new Defcon is produced. Your artwork's a lot of fun. I really appreciate your use of color, and you have a great sense of "tone." Hi all, Here's my latest piece. Again for Mike's Defcon sequel. 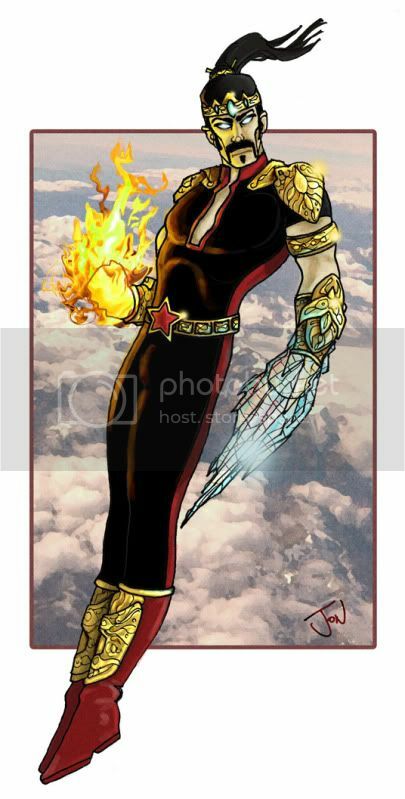 This guys a Chinese Paragon with elemental powers.. you know.. super tough. had a blast with this one, especially the armour pieces. I really like your Soviet Swordsman coloring. Your texture work is just awesome!